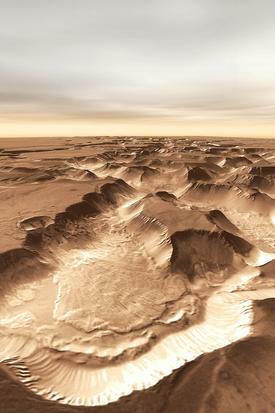 Landslides are common features in canyons on both Earth and Mars, and they happen the same way. Erosion undermines a canyon wall until abruptly millions of tons of rock come crashing down. The event causing a landslide may be quite small: a trickle of water in the right place or even winds from a storm tipping a precarious balance. Or the impulse may come from a more substantial kick: seismic waves from an earthquake that shake the wall-rock, widening cracks until gravity starts the slide moving. In the case seen here, the impact of a meteorite landing near the edge of the canyon may have done more than just blast a crater 6.5 kilometers (4 miles) wide. The impact may also have triggered the massive landslide, either at the time of impact or shortly after. While craters occur randomly near canyon rims, usually such craters show only a small, ordinary apron of debris at the foot of the wall, as for example this crater in Juventae Chasma. Compare that scene with an aerial perspective of this canyon-side crater and their differences are clear. In the Juventae Chasma case, the impact occurred before the canyon rim had eroded close to the crater, so the crater's formation added little to the debris accumulating at the foot of the wall. In the example here, however, the crater stands at the head of a large landslide that reaches more than 25 km (15 miles) across the canyon floor. Did the slide immediately follow the impact? Hard to say without doing fieldwork. But there is evidence (see below) for the slide occuring in two stages, so the event, catastrophic as it was, probably unfolded over a period of time. The canyon here belongs to the vast Noctis Labyrinthus system, which lies directly west of the giant rift valley, Vallis Marineris. Noctis, which also adjoins the volcanic region of Tharsis, curves across Mars for more than a thousand kilometers (620 miles). Scientists think Noctis formed when tectonic forces pushed up the surface, stretching the crust and causing deep geological faults. The faults allowed subsurface water to escape and the ground collapsed, creating the canyon network. This false-color image combines frames taken in daytime at visible wavelengths with ones made at night at infrared wavelengths. The camera was THEMIS, the Thermal Emission Imaging System, on NASA's Mars Odyssey orbiter. Looking down as Mars Odyssey travels in a nearly pole-to-pole orbit, THEMIS surveys the Martian surface at 5 visible and 10 infrared wavelengths. While THEMIS' daytime visible images record the scene passing below much as a human eye would see it, the nighttime infrared images provide hints about the surface materials. The difference is sensing warmth. Taken late at night, the infrared images detect the ground temperature, which varies in part due to how much rock or dust lies exposed. Rocks and hard sediments tend to hold heat better at night then do patches of dust, sand, and fine-grain materials. Color-coded for temperature - reds are warmer, while blues are cooler - this THEMIS false-color mosaic maps the surface rocks and materials. Here, for example, ribbons of debris from the landslide make a pattern of ridges running out from the slide's source. Their reddish color indicates most of the surface is rocky or covered with toughened sediments. Between the ridges, however, the low areas have collected dust and sand, as shown by dunes and cooler colors. The THEMIS image also reveals another fact about the landslide. While it is younger than the canyon, the slide occurred long enough ago for craters to have formed on it. Dating a surface by counting craters is always an imprecise art, but it appears the slide has been around long enough to collect a number of crater 150 to 400 meters (yards) across. These could give the slide an age of a billion years at least. The canyon floor lies about 3 kilometers (9,800 feet) lower than the tableland that forms the upper surface. Such a vertical drop - not to mention the impact blast itself - would give ample opportunity for landslide debris to "catch air" as it fell. From studying terrestrial landslides, geologists found that if air gets trapped under a big slide, it acts as a cushion and lubricant, helping to shoot debris for astonishing distances. While Mars' atmosphere is now only 1 percent as dense as Earth's, it may have been thicker at the time of the slide - and even if it wasn't, any trapped air would still help the debris go farther. The sharp, curving ridge seen at the top of the close-up image extends from a large mesa that forms the canyon's northern side. The main image shows that where streams of debris shot across the canyon floor and met the mesa's upward slope, they slowed and began to pile up. In effect, the landslide stubbed its toes as it reached the mesa. This also slightly deflected the ends of the debris toward the east (right). When the edge of a canyon collapses in a landslide, large blocks often remain partly intact. If they do, they rotate backward as they fall, like skaters whose feet shoot straight out from underneath them. Small, light-colored ridges make broken parallel lines running roughly east-west (left-right) in the close-up picture. These may be the edges of blocks that survived the collapse without being completely shattered. They also hint that the canyon walls contain layered rocks whose stratified nature is largely buried by erosion's debris. Stepping back to look at this area in the main image, it seems as if parts of it overlie the linear ridges of the main slide. If such is the case, then this part of the landslide followed the main slide's collapse. By how much, though, is an open question - it may have been by minutes, hours, or many years. Compared to the ridges and channels on the main landslide, which are roughly 100 meters (yards) high, the slope descending from the mesa appears smooth at first glance. Yet a closer look shows it is gently furrowed with grooves. The grooves resemble gullies eroded into the talus slope, like the famous gullies discovered in 1999 by the Mars Orbiter Camera and found in many places on Mars. While those were probably carved by trickles of water - scientists are still arguing the question - the nature of the surface here points to a different process. Many slopes in Noctis Labynthus are covered with sheets of sand-size particles. Here the grooves run downhill. But grooves on sand sheets in other parts of Noctis run across the slope, which suggests that gravity is only one factor controlling their development. Wind, especially downslope in this case, is the most likely additional agent.